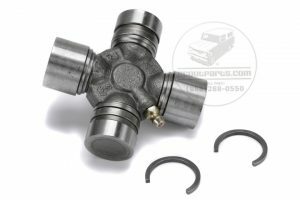 It can sometimes be very hard to find u-joints for International Harvester Scouts, Travelalls, and Pickups. Have you gone to the parts store asking for U-joints, only to get a blank look from the counter staff after they type in a few key strokes on their computer? This is happening because the last 10 years of Scout and IH truck production is a period when this data was moving slowly onto computer data bases. In the 1970’s there was a great deal of resistance to moving from parts books and micro phish to computer databases. I have heard heart breaking stories of family owned dealerships that we forced out of business because of their reluctance to adopt computers into their dealership. Scoutparts.com and Travelall.com has endeavored over the years to rebuild data bases in order to supply you with the correct U-joints for all the different applications used by International Harvester on their Light line Scouts and trucks. Search for U-joints here.